Because we care! 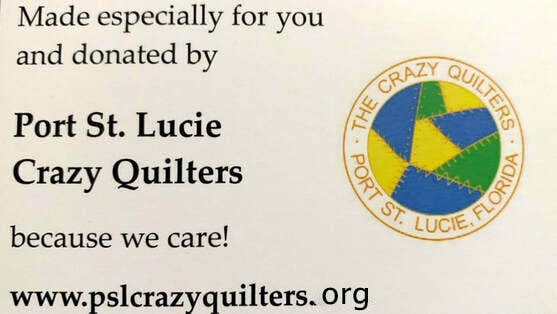 The Port St Lucie Crazy Quilters contributes to our communities by making textile items and donating them to local organizations, medical facilities and individuals in need. Members give generously of their time, talents and fabric stashes. Our Philanthropy activities are truly amazing and very rewarding to be a part of. A Philanthropy table is set up each month at our Guild meetings. Members are welcome to pick up a “kit” which can be taken home to sew. Items are not checked out and there is no set date for their return. We only ask that upon completion, please return the project to Philanthropy. PSLCQ hosts a Charity Sew-In day on the 5th Wed of each month with a 5th week – about 4 times a year. All are welcome to come for any amount of time between 9:00 AM and 3:00 PM. . Many beautiful items are generated from these fun get-togethers. Pre-cut “kits” are available to pick up and sew. Most people bring their sewing machines and supplies. Those that do not bring their machines usually work on making “kits,” using our fabric, patterns, and supplies. For any questions about PSLCQ’s Philanthropy activities or if you know of a need we can support, please contact the Philanthropy Chairperson at philanthropy@pslcrazyquilters.org.